This case study concerns the long-term impact of fluid cleanliness on the transmission gearboxes of large power generation wind turbines in Northern California. A large wind turbine power-generating project in Northern California experienced abnormal wear in the gears and bearings of the primary gearboxes used to transfer energy from the wind turbines to the generators. Gears wore fairly quickly, becoming excessively loose, much quicker than the design specifications. Tear down inspections failed to pinpoint one particular failure mechanism while vibration analysis found no specific problems, except steady but rapid wear resulting in looseness. Operators were replacing gears every year due to excessive wear, even though analysis showed no cause for concern, the oil was of the proper type and grade for the application, and met the gear manufacturer’s specifications. Oil analysis of used oil samples from these gearboxes showed very high particulate levels along with wear metals from both the gears and the bearings. Tribological examination of the gears and the bearings showed evidence of severe abrasive wear with deep gouges and grooves in the bearing surfaces and gear teeth. Heavy notched steps worn into dedendum (root) of the gear teeth were also observed, along with contact fatigue at the pitch line. These gearboxes operate in a dry, dusty environment, with lots of airborne dust and contamination. Fine airborne dust was getting into the gearboxes through the breathers lines, which had no air filters. The particles were getting caught between the bearing surfaces and the gear teeth and acting as an abrasive. The hard dust particles were cutting, gouging and scraping away the bearing surfaces and gear teeth, leaving deep grooves and notching the gear teeth. This eventually resulted in looseness in the bearing and gear. 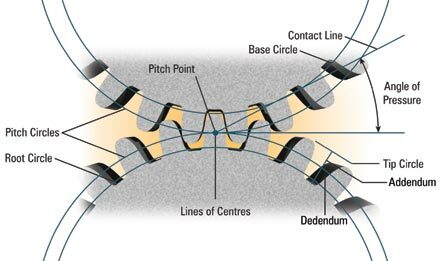 Dust particles trapped between the gear teeth at the pitch line were causing the entire load to be transferred at a point contact instead of across the entire width of the gear tooth as the gear teeth meshed, resulting in contact fatigue failures at the pitch line. 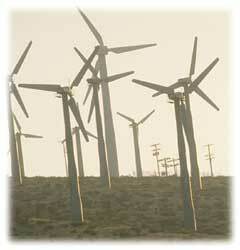 Each wind turbine gearbox lube system was drained and flushed to remove all dust, dirt and debris. Operator installed filters on the breathers, and installed surface conforming plastic barriers (bags) on the top of the breather tubes. This allowed the system to continue to breathe with the gas volume needed to expand and contract with changes in temperature and atmospheric pressure while preventing dust from being ingested into the system.